Selecting the right wainscoting for your room can be difficult and overwhelming especially since there are so many different styles from which to choose. You know you want to add accents to your wall, but don’t know where to begin. I hope I can help you sort it out.Whichever type of wall paneling or wainscoting you choose will determine the look and feel of your room. Some things to consider are how you want the room to function and the type of feeling you want to get from the room. Let’s explore some different options. One of the more common types is the “picture frame” wainscoting, as shown in an earlier post of our dining room (HERE). This is a more formal look and has the boxes protruding outward from the wall like a picture frame. This is a very traditional look and commonly used in dining rooms. If you’re looking for modern yet rustic style lighting to accent your space, these chandeliers are beautiful in a dining or eating area 6-Light Candle-Style Chandelier. The picture above also shows shadow box frames, but these shadow frames are bigger and thicker and give a more pronounced appearance. This trim is available in several different sizes and thickness. It is easy to install and can be placed directly over drywall. This picture is a “raised panel” style of wainscoting and is more expensive than the shadow box style. This style is formal, elegant and quite traditional. The homeowners chose to panel the entire room, given it a very dramatic appearance. The home owners chose an interesting style of lighting, but I think a touch of glam would be perfect in this space such as the 5-Light Drum Chandelier Finish: Peruvian Silver. Another example of raised panel wainscoting is being used here on the side of the stairs in a renovated farmhouse. This picture shows that you can use a formal raised panel style in a farmhouse for casual elegance. By the way, don’t you love that 3 light hanging pendant? It’s such a great light for a foyer, it is available (HERE). Another example of raised paneling use is on these doorways, in a more formal home. The paneling goes to the ceiling, and has corbels on the inside upper corners for an even more formal look. If you’re going for a more rustic look, you could try the barn door wainscoting, which gives the appearance of barn doors. I have never tried this look but think it would look fantastic on the corners of a kitchen island. The shoulder height wainscoting shown above, such as the name denotes, comes to approximately your shoulder in height, looks elegant and adds so much warmth to any room. It is beautiful in an entryway, as you can see by this picture, leading into the kitchen. The type shown here is the “square over rectangular” board and batten wainscoting. It’s more of a modern farmhouse and craftsman style and coordinates beautifully with the shaker cabinetry. This style of board and batten, I have discussed in another post (HERE). This style uses long rectangular boxes, and is also considered shoulder height. It is also a modern farmhouse style. This similar type of rectangular wainscoting doesn’t go as high up the wall and is perfect for a bathroom. This style goes up to about 3′. This picture shows a combination of shoulder height and picture wainscoting. The ceilings are quite high, so the chair rail goes quite far up the wall, and gives this room a very regal look. I love these regal looking chandeliers, I found similar ones like this 6-Light Candle-Style Chandelier Finish. The picture above features a full wall of board and batten wainscoting, using square boxes. We installed this in our living room on one wall of the room, such a beautiful feature for a room. Since it is a busier look, I would install only on one wall, using as an accent wall. You can read more about accent walls (HERE). In this type of accent wall, the size of your boxes will be determined by the width and height of the wall. Be careful to measure the wall space and calculate the size of your boxes based on the wall space. You want the boxes to be symmetrical all the way across the wall and down the wall, so plan carefully…the look is worth all the extra effort. Another very beautiful and more of a coastal look and feel is beadboard, commonly used in beach and lake houses. Beadboard usually comes in panels and is easy to install. They are perfect in bedrooms, bathrooms or living areas. The look can also create a cottage and farmhouse feel. This is another example of beadboard in a hallway. Another type of wainscoting is a combination of the traditional picture frame and board and batten. In this picture, you can see that batten boards were installed and then shadow box trim was added to the inside of the batten for a more formal appearance. You can see from a side angle how the picture frame molding is recessed inside the batten squares. Picture frame molding is also beautiful inside of door frames and give the entryway a more formal appearance. I love the styling with the stone walls, exposed beams, slate floors and wooden entry doors. You have heard me say it before, and I’ll say it again. In my opinion you can never have too much molding in your house, if it’s done tastefully, it is so beautiful and classic and will never go out of style. 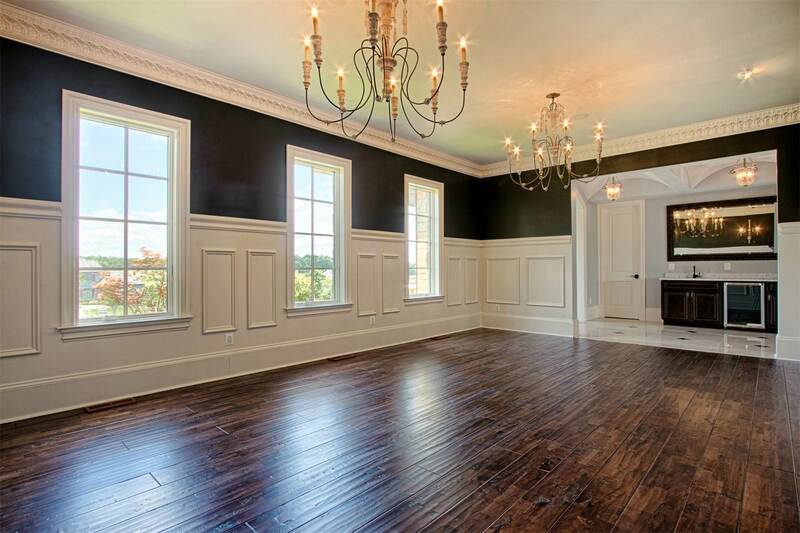 Wainscoting can make any room more stylish and comfortable. Which one will you pick for your next project? Drop me aline. Thanks for stopping by. I hope I inspired you to add some type of molding or trim to your next home project.